The first batch of charge-coupled devices, or CCDs, to be flown on ESA's PLATO space observatory was accepted by ESA last month. This is an important milestone on the road to creating a groundbreaking spacecraft that will detect Earth-sized exoplanets in orbit around nearby stars. PLATO, or PLAnetary Transits and Oscillations of stars, is the second ESA-led mission to be dedicated to exoplanets – planets beyond our Solar System – and the third with ESA participation. Currently planned to be launched in 2026, PLATO will follow in the footsteps of CHEOPS, the CHaracterising ExOPlanet Satellite mission, scheduled for launch later this year, and the CNES-led CoRoT mission, which operated between 2006 and 2014. PLATO's primary task will be to search for rocky, Earth-like planets orbiting relatively nearby stars that are similar to the Sun. Over periods of months to years, PLATO will utilise highly sensitive light detectors – rather like advanced versions of the CCDs used in digital cameras – to monitor the changing brightness of thousands of stars. The CCDs in PLATO's cameras will detect any slight dimming and brightening of a star caused by one or more planets moving in front of it. Such planets are extremely difficult to detect and study because of their small size and faintness, proximity to their stars, and great distance from Earth. The CCDs will be a key element of PLATO's scientific instrument, which is being provided by a consortium of European research centers and institutes. The instrument will boast the largest digital combined camera ever flown in space, receiving light from 26 telescopes, all mounted on a single satellite platform. The combined camera will have an extremely wide field of view, covering a total area on the sky of approximately 2250 square degrees – as a comparison, the full Moon spans only about 0.2 square degrees on the sky. PLATO will make use of this huge coverage area by pointing its telescopes simultaneously at a small number of chosen 'fields' in the sky. Depending on the science operations plan that is eventually selected, PLATO will observe between 10 and 50 per cent of the sky from its orbital location around the L2 Lagrange point, 1.5 million km away from Earth in the anti-Sun direction. Each telescope will include four CCDs that have been specially designed and produced by Teledyne e2v in Chelmsford, UK. 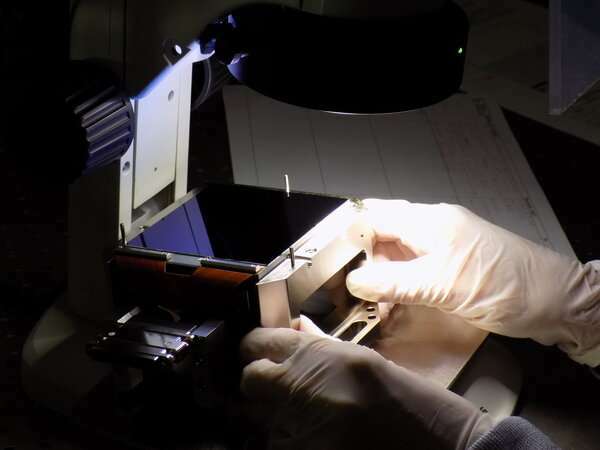 The first 20 CCDs for PLATO were accepted for delivery by ESA in mid March, and the remaining 84 detectors will be delivered in further batches before the end of 2020. "The delivery of the first detectors at this time is important because it secures the early availability of one of the key elements of the whole mission," said Bengt Johlander, PLATO payload manager at ESA. "It also enables the PLATO team to proceed with the first stage of the complex integration and testing of the large number of telescopes in the satellite." The PLATO CCDs produce each an image of 20 megapixels (or Mpixels), which is equivalent to the output of a mid-range commercial digital camera. Most of the CCDs will take measurements every 25 seconds, but eight of them will be fitted in two 'fast' telescopes that will make measurements of brighter stars every 2.5 seconds. Each telescope will therefore comprise about 80 Mpixels, resulting in a full satellite total of 2.12 gigapixels (Gpixels). This is over twice the equivalent number for ESA's Gaia misssion, which currently features the largest camera ever flown in space. 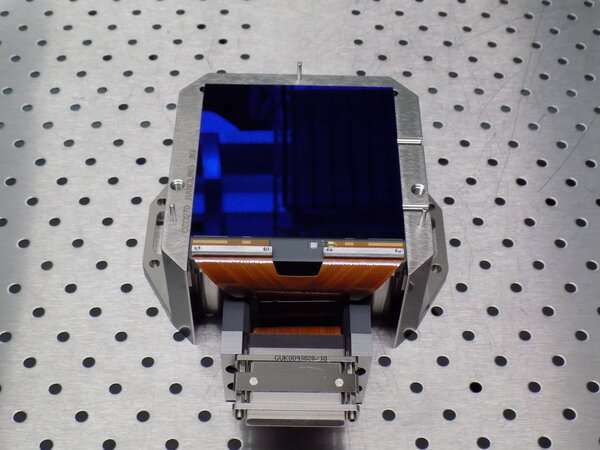 The large format of the CCDs – approximately 8 cm × 8 cm per detector – will result in a total optically sensitive surface of 0.74 square metres. The detectors will work at a temperature lower than -65°C to maximise their sensitivity. PLATO will not only search for new planets but also study the properties of their host stars, and determine the planetary masses, sizes and ages with unprecedented accuracy, to improve our understanding of planetary system architecture and identify potentially habitable worlds. PLATO is the third medium-class mission in ESA's long-term Cosmic Vision programme. Its objective is to find and study a large number of extrasolar planetary systems, with emphasis on the properties of terrestrial (rocky) planets – some of which may be in the habitable zone around Sun-like stars. During its planned four year prime mission, PLATO will observe hundreds of thousands of stars, leading to the discovery and characterisation of thousands of new exoplanets. PLATO will scan and observe huge areas of the sky, concentrating on the brightest and nearest stars. PLATO has also been designed to investigate seismic activity in stars, enabling the precise characterisation of a planet's host star, including its age. ESA is providing the spacecraft, the CCDs, the mission operations, and parts of the science operations. The PLATO Mission Consortium, funded by national agencies, is providing the payload and contributes to the science operations.